Take that elf down from the shelf, friends, Christmas is over. I don’t have one of the little guys so I have to mark the end of the Season of Using a Naughty Overpriced Plastic Doll to Scare Kids into Behaving in a different way. Mainly by daily threatenings to return all gifts to Santa. (But since 2/3 of my children are no longer believers and 1/3 has a bad case of selective hearing, my threats are nothing more than idle if even heard). 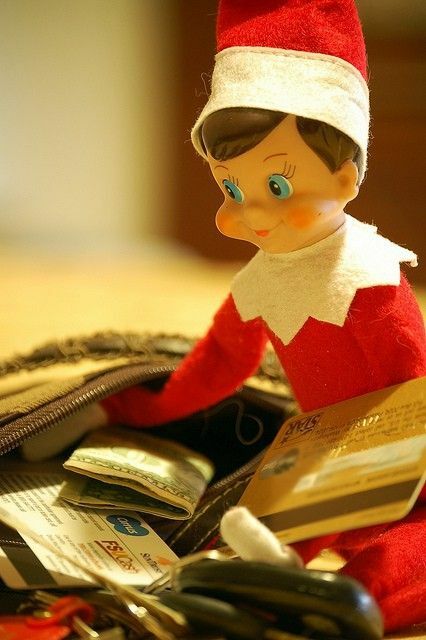 How does a naughty elf encourage good behavior? I mean, I get that it’s fun to have him/her do silly things every night (actually this a lie because the thought of having to remember to do one more thing EVERY NIGHT in the month of December and then to have to make that one more thing a creative one, STRESSES. ME. OUT. ), but how does that translate into outright fear of misbehavior? Every morning this is the conversation I have with my children, “WILL YOU PLEASE PUT THE CAP BACK ON THE TOOTHPASTE SO IT DOESN’T GET ALL OVER THE COUNTER?? AND SQUEEZE FROM THE BOTTOM. SQUEEZE. FROM. THE. BOTTOM! !” How could this possibly help lower the toothpaste covered counter incidents in my home? My heart is pounding just looking at this picture because, really, I don’t have enough kid-created messes to clean up, I’m going to make some of my own? Do you know when this would be cleaned up at my house? June. Maybe. If my ultimate goal is to scare my kids into never misusing toothpaste again, how could this possibly help? Have your elf steal from you. Because it’s not enough you paid $30 (if you got a deal) for this creep, now he’s going to take your cash, charge up your credit card, AND teach your kids it’s okay. This is the guy Santa’s sent to keep an eye on them, right? So either Santa’s been snookered just like everyone else who’s bought into Elfie/Mr. Jingles/Harvey (or whatever pseudonym he’s using at your house) or Santa’s standard have seriously slipped. Call me dense or clueless or the meanest mom ever, but I just don’t get it. I mean, I’m not against fear. I’m pro-fear. Kids should be scared into being good. But how does a mirror defacing, purse invading, syrup sucking doll accomplish this? Especially when he’s kept in a box for eleven months out of the year. Here’s how it’s always worked at my house (and the house I grew up in). The kids have a week after Christmas to get all their fighting and naughtiness out without too much retribution. Hopefully they’re distracted enough by all their new crap that things don’t get too out of control. But starting January 1st, Santa’s elves start watching again. But only Mom can see them. They’re always peeking in windows somewhere. And they’re are windows everywhere. Go ahead, think of somewhere without windows (okay, outside, but the elves are already out there). Dungeons, right? And let’s see a kid misbehave in one of those. The elves are always watching. ALWAYS. And there’s more than one of them. Fear can be free, my friends. Free. All you have to do when naughtiness is about to erupt is calmly say, “Oh, I think I just saw an elf peeking in the window.” Stops them in their tracks. Now the focus has gone from being bad to being outright scared of something they can’t see but can see them. Fear of the unknown, people, is the greatest fear of all. Boom. Elves go from rosy cheeked pranksters to a cross between Edward Cullen and Chucky. Happy New Year and You’re Welcome. Down with that damn elf! My thoughts exactly! 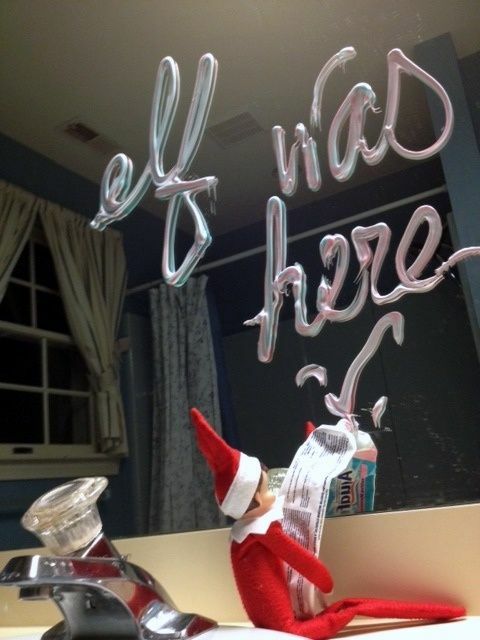 Thank you for making me feel better about being the only lame mom on the block that doesn't do the bloody elf on the shelf.